Pasqualina Brasacchio first appears in the Painesville, Ohio, area in 1919, when her family moved from Ashtabula, Ohio. In America, Pasqualina Brasacchio was known as Lena Brasacchio, then, after she married, Pat Dolce. Pasqualina Brasacchio, daughter of Giovanni Battista Brasacchio and Francesca DeBiase, was born on October 9, 1902, at Lapprano, Italy. She married Joseph Dolce, son of Francesco Dolce and Francesca Geraci, about 1921. Pasqualina died on February 3, 1989, at LakeEast Hospital, Painesville, Lake County, Ohio, at age 86. Her body was interred at Riverside Cemetery at Painesville, Lake County, Ohio. Pasqualina Brasacchio immigrated to the United States on March 22, 1907, at age 4, travelling to Ashtabula, Ashtabula County, Ohio. She was accompanied by her mother and brother, Eugenio. They were joining Pasqualina’s father, Giovanni Brasacchio in Ashtabula. 1. Frank Dolce was born on July 11, 1921, at Painesville, Lake County, Ohio. He married Grace M. Samartino, daughter of Thomas Samartino and Angeline Tabone, on March 29, 1947 at Erie, Erie County, Pennsylvania. Frank died on July 2, 2009, at Lake East Medical Center, Painesville, Lake County, Ohio, at age 87. His body was interred at Riverside Cemetery at Painesville, Lake County, Ohio. 2. John Dolce was born on August 26, 1923, at Painesville, Lake County, Ohio. He married Dorothy Misch. John died on May 1, 2006, at at his home, Painesville, Lake County, Ohio, at age 82. His body was interred at Evergreen Cemetery at Chagrin Falls, Cuyahoga County, Ohio. 3. 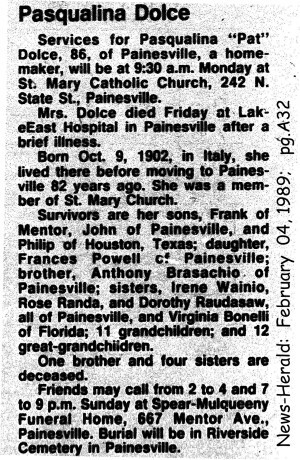 Philip William Dolce was born on June 20, 1925, at Painesville, Lake County, Ohio. He married Rita Irons about 1952. Philip died on July 7, 2010, at Jacksonville, Florida, at age 85. His body was interred at the VA Cemetery of Jacksonville at Jacksonville, Florida. 4. Frances Dolce was born about 1927, at Ohio. She married Jack Powell.